I love Paris, but Switzerland isn’t helping matters. The longer I live in Switzerland, the harder and harder it is to travel anywhere, particularly a place known for being littered in dog poop. While Swiss Tourism just ran an ad, jokingly claiming they even clean bird poop from mountains, the French, on the other hand, don’t bother cleaning much of anything—bird, dog, and horse poop included. It’s everywhere. And I find it amazing that a culture so concerned with appearances and filled with manicured people and well-maintained parks can be so passive about poop. I like to think it’s because the French culture is so creative that their heads are simply in the clouds but really, this kind of attitude doesn’t do much for the glamour on the streets because from my experience, in under two days, any kind of footwear fashion statement will turn a dark shade of gray. Still, a little (or even a lot) of poop isn’t going to stop me from going to Paris and they know it. Thus, the cliché of April in Paris still charmed me, dirty shoes and all. 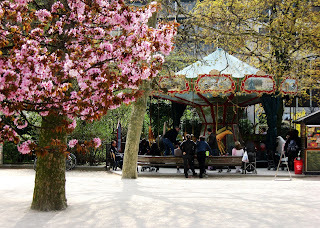 Because when one is rewarded by flowering trees, grand buildings, and colorful carousels, they have no reason to look down and think that maybe that nice soft ground they’re standing on is anything but a lush patch of grass. And the French have freakishly perfect pastries. YT > yeah, but having your perfect french pastry tasting ruined by a step in dog poop is way worse than enjoying a pretty good swiss pastry while walking on a clean sidewalk, isn't it? But I'm biased: I don't like "pâte feuilletée" so french pastry isn't my cup of tea. I read a great book coming over here about french attitudes (to prepare me for swiss french attitude) and it talked about the exact same thing with the poop! It was called "Talk to the Snail" and the dog poo was in the chapter called "Thou shall not love they neighbor". It also included attitudes towards waiting in lines, smoking, and driving. All things that drive me nuts! There's also a great book, "A Year in the Merde," by a Brit living in Paris.